Notes: Death rates are age-adjusted. Deaths per 100,000 standard population. Breast cancer death rate is per 100,000 females; prostate cancer is per 100,000 males. These breast and prostate cancer death rates differ from those published by National Center for Health Statistics, which are based on the population of both sexes. The top five cancer causes overall were also the top five for the non-Hispanic white and black populations, but prostate cancer was not among the top five for the Hispanic population. As the underlying causes of death, lung and bronchus cancer was coded as C34, colorectal cancer as C18–C20, breast cancer as C50, pancreatic cancer as C25, and prostate cancer as C61 based on the International Classification of Diseases, 10th revision. Data Source: National Vital Statistics System. 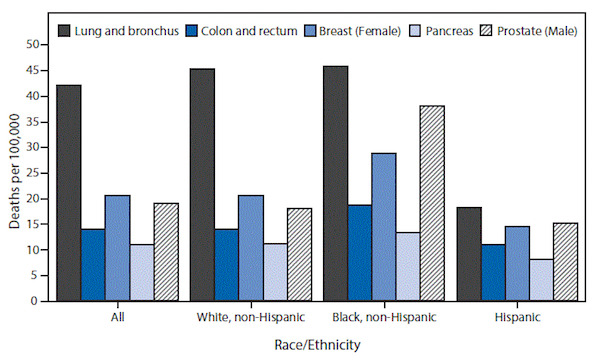 Underlying cause of death data, 2014. This entry was posted in Medicine and Society Data Watch on September 21, 2016 by Genevra Pittman.